The automatic organist is a help to any church wishing to have traditional reverent worship but lacking a pianist to play the hymn tunes. A new software version of George, the automatic MIDI accompanist, is now available as a free download for PC, and is capable of playing hymns and choruses on most keyboards. 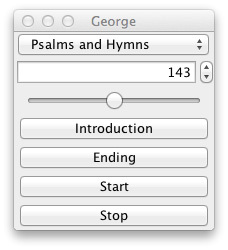 The software includes all the hymn tunes in Psalms & Hymns of Reformed Worship (including supplement), and all the choruses and hymns in Our Own Hymnbook for Sunday Schools. This selection of tunes overlaps considerably with other traditional tunebooks, making the system useful for many churches using a variety of hymnbooks. The software will run on a desktop or laptop and is extremely simple to operate. Note: George can only work with an organ or keyboard with a MIDI input socket. Many inexpensive MIDI keyboards are suitable. 1. Obtain a USB-to-MIDI lead; these are inexpensive and readily available on the internet. 2. Install Java first on the desktop or laptop; this a free download available from http://www.java.com/en/. 3. Download the George file and place on the desktop of your computer. 4. Make sure the computer’s ‘sleep’ mode is turned off. 1. Turn on the keyboard/organ and connect it to the computer with the lead. Just connect the lead’s OUT connector to the keyboard’s MIDI IN socket (the lead’s IN connector is not used). This must be done first or George will not work. 2. Double-click the George program icon to start it. A small window will appear. 3. Select the tunebook of interest from the drop-down menu, and then type in the tune number. Users will need to purchase Psalms & Hymns of Reformed Worship, music edition and Our Own Hymnbook, music edition to determine the numbers (see Tabernacle Bookshop website). 4. Speed is adjustable using the horizontal slider. 5. Click ‘Introduction’ if you want the unit to play an introduction to the hymn or chorus, and then ‘Start’. 6. George will play the hymn tune repeatedly; click ‘Ending’ during a verse to make the player stop at the end of that verse. Click ‘Stop’ to halt the player immediately. 3. Download the Tamil George file for Hymns of Reformed Worship and place on the desktop of your computer. 1. Turn on the keyboard/organ and connect it to the computer with the lead. Just connect the lead’s OUT connector to the keyboard’s MIDI IN socket (the lead’s IN connector is not used). This must be done first or Tamil George will not work. 2. Double-click the Tamil George program icon to start it. A small window will appear. 3. The tunes from Hymns of Reformed Worship are pre-loaded onto the player. Type in the hymn number to select the corresponding tune (users will need a copy of Hymns of Reformed Worship). 4. Speed is adjustable using the upper horizontal slider. 5. The gap between verses is adjustable using the lower horizontal slider. 6. Click ‘Introduction’ to make the unit play an introduction to the hymn or chorus. 7. Tamil George will then automatically play the full hymn tune repeatedly; click ‘Ending’ during a verse to make the player stop at the end of that verse. Click ‘Stop’ to halt the player immediately. 'Start' makes the player play the full tune without an introduction. C H Spurgeon 1854-1892. A large congregation proclaiming the Gospel of Christ and the doctrines of grace. Sunday services in Spanish, French, Chinese, Farsi. Bible study in Spanish.